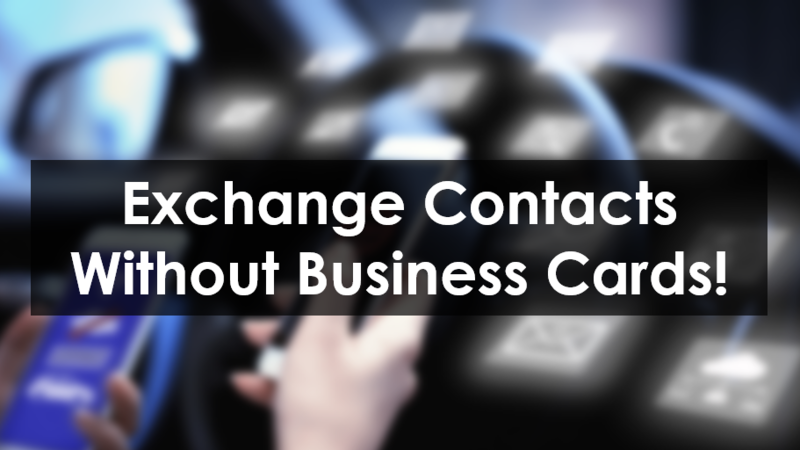 Exchange Contacts Without Business Cards! Handing out paper Business Cards with someone you just met has been a tradition for centuries, although it is seeing a decline as we advance towards a modern and digital age. There are various ways to exchange your contacts now thanks to various platforms and here, we share with you what are the alternatives to paper Business Cards. Clicking on that green icon on your phone to save their contact number is fast and easy. However, them forgetting the services you offer is also fast and easy without much information being available through that simple contact list. This method is mostly used if you are conferencing with a big group, and you don’t have the time to attend to them individually. Telling them to drop you an email or visit your website is a bold move, and would only work if you are really famous for them to remember, or if they are really interested in what you are selling. There are so many Social Media platforms nowadays, Facebook, LinkedIn, Twitter etc., and i’m sure you have tried at least one of them. They are fun and interactive, and you can add each other with a simple search on a name or user ID. It’s one of the more popular methods, but could come as intrusive or too personal to share to some people. With the rise in mobile users, developers are riding on the trend of mobile applications. There are many mobile applications that encourages the exchange of Business Cards digitally, and one such example is AceConnectMe. It lets you input your phone number, email, website as well as link your Social Media accounts (optional). Your e-Business Cards are also stored in one organised space for easy searching when needed. The major downside is that you require mobile network to use the app, but I would’t complain with the many conveniences and benefits it offers.